"The land of Jungle Book"
A delightful town situated in the district of Mandla, Kanha National park is the haven of an exceptionally wide variety of wild animals, including the majestic creature tiger. Wide open grass plains with a backdrop of the city scrapers, scattered bamboo forests play host to a wide variety of wildlife and diverse birdlife with over 300 species recorded. The present-day area stretches over 940-kilometre square which is divided into two sanctuaries: Hallon and Banjar. Located in a central region of Madhya Pradesh it is the largest National Park in central India and has been ranked as one of the best parks in Asia. Among the 22 species of large mammals, the royal Bengal tigers are a major attraction. The park was established in the year 1955 and has since actively contributed to the preservation of many endangered species. The National Park was taken under the Project Tiger Reserve in 1974. Abundant in flora and fauna, the Kanha National Park houses one of the rarest species of deer- the Barasingha. One of the most scenic wildlife reserves in Asia today, this National Park came to be known the world over through Rudyard Kipling's book- The Jungle Book. An alluring and picturesque landscape, it is famous for its wildlife safaris and attracts tourists from all over the world. Other important animals in this park are leopards, wild dogs, wild cats, foxes, sloth bears, hyenas, langurs, wild boars and jackals. Reptiles including pythons, cobras, krait and other varieties of snakes are also found in this National Park. Being a highly commercialized forest, the Kanha National Park has plenty of stores from where you can buy traditional handicrafts, t-shirts and souvenirs. The Sudhanyakhali watch tower is a popular spot that provides a view of the Mangrove forests for spotting this royal creature. Visitors can enjoy the park’s walking trails, picnic sites and three campsites for wildlife spotting and leisure activities. One of the major tiger reserves in India, apart from the tiger reserves at Sariska, Ranthambhore & Jim Corbett National Park, Kanha National Park is a bustling wildlife sanctuary situated in the state of Madhya Pradesh. Divided currently into two sanctuaries, Hallon & Banjar, the lush green landscape and ravines of this site inspired author Rudyard Kipling to give his most significant creation ever, The Jungle Book. The tiger reserve that is the centre of attraction in Kanha National Park, houses the endangered species of Royal Bengal Tiger. However, this is not the end. Kanha also sports a wide range of exquisite flora and fauna, from the lush green sal and bamboo trees to the rare breeds of hard ground stag [Barasingha], Gaur [Indian Bison], Swamp Deer as the list goes on. So if you're anywhere close to this beautiful wildlife sanctuary, don't miss it, even for once. Kanha brings around 300 species of birds which attracts many bird watchers and photographers for taking account of these majestic creatures. Excellent birding surrounds the eastern region where they can explore the trails, waterways and forests in search of elusive species. With an array of birds that are unique to this area of Madhya Pradesh, species in the park include storks, teals, pintails, pond herons, egrets, peacock, peafowl, jungle fowl, hoopoes, drongos, partridges, quails, ring doves, spotted parakeets, green pigeons, rock pigeons, cuckoos, spurfowl, painhas, rollers, bee-eater, warblers, woodpeckers, finches, kingfishers, orioles, owls, and flycatchers. A binocular, bird guidebook and a camera equipped with suitable lenses are must-have essentials to experience the kaleidoscopic avian beauty. Bird watchers and researchers are often attracted by the exotic species in these grasslands such as Asian Paradise Flycatcher, White Rumped Shama, White Bellied Drongo, Spangled Drongo. Racket Tailed Drongo, Tawny Babbler, Jungle Babbler, Indian Scimitar Babbler, Grey Francolin, Painted Francolin, Black Naped Flycatcher, Common Iora and Eurasian Blackbird. Hundred of acres of grassy meadows, ravines and streams, indeed a paradise for the wildlife in Kanha. Fitting under such a description of the geography, the park provides natural habitat to a huge variety of animals. Also known as the Kanha Tiger reserve, it is a home of several tiger species including the Royal Bengal tigers which attracts a major population of wildlife enthusiasts. It also hosts a large population of leopards, jungle cats, wild dogs and jackals. Some commonly spotted mammals in the reserve are tiger, chital, sambar, barasingha, barking deer, chousingha, gaur, langur, wild pig, sloth bear, black buck, hyena, wild boar, rudd mongoose, Indian Fox, Badger, Indian Hare and Wild Dog along with several species of reptiles including Indian Monitor, Fan Throated Lizard, Indian Garden Lizard, Russell’s Viper, Python, Indian Cobra, Indian Krait and Rat Snake. The reserve has been instrumental in hosting some of the very rare and endangered species of mammals, reptiles and birds. Also known as the Sunset point of Kanha, Bamni Dadar is the highest plateau in the national park offering a serenading view of the vastness and beauty of the meadows. Many visitors review this as the most beautiful place to experience the awe-inspiring view of the sunset. This is the last location for most evening safaris organised by the park for spotting the barking deer and Indian bison. Jeep Safari is the best way to explore Kanha. It is very easy to find a jeep safari in Kanha, as it is one of the hotspots in India for spotting tigers. Since the costs are typically per jeep, its advisable to share your jeep in case seats are available. The safaris are allowed in two slots: morning (6am to 11am) and afternoon (3pm to 6pm). Morning slot typically has more chances of spotting tigers. The costs would be around INR 1000-2000 for a jeep. The evening safaris are slightly cheaper than the morning ones. Elephant safaris could be very exciting here and they are typically available in the morning slot. It might cost you around INR 300-600 per head. Being a national park, the eating options here are limited to the ones inside the hotels and resorts. These can provide you both local delicacies as well a multi-cuisine experience. The local delicacies of Madhya Pradesh that you might chance upon here include Dal Bafla, Biryani, Kebabs, Bhutte ki Kees, Korma, Poha, Rogan Josh, Jalebi, Ladoos as well as beverages like Lassi and Sugarcane Juice. Day 1 - Reach Jabalpur, preferably by noon, and take some rest. In the evening, you can take a stroll on the city side, and buy some curios and souvenirs for yourself. Or if you're enthusiastic enough, you can set off at once for the main national park. 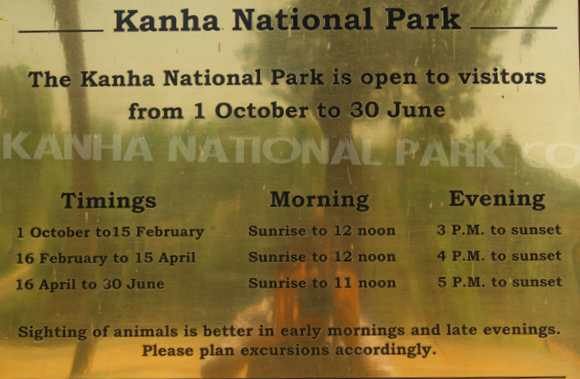 Day 2 - The next day should ideally be the start of the trip to the Kanha National Park. You can start with the tour of the Tiger Reserve, which houses the Royal Bengal tigers. Not very far from is the reserve that houses the Indian bison, Swamp Deer & also the rare breeds of Hard Ground Stag [Barasingha as known in local lingo]. - Get your accommodation in advance and book safaris well in time.- Keep in mind the timings of the park. The park is closed between July and October and the visiting hours are during day hours only.- Sharing a jeep safari is advisable as safaris are charged per jeep.- Maintain the rules and regulations of the National Park. Congested in peak seasons. Not easily accessible. Ideal for tourists of every kind. Suitable for backpackers from places like Jaipur, Jodhpur etc. Which are the best places to stay at near the reserve? Answer: Krishna Jungle resort and Wild chalet are good resorts near Kanha National Park. Krishna also has a swimming pool and you can easily go there with family. The resorts will also organize your jungle safari.